“Now I will pretend to be a woman in the Viking period!” Our guide, a distinguished archaeologist in his mid-60s, slid a braided, blond wig over his own short hair as he sidled up to the weaving exhibit. With strands in each hand, he demonstrated how countless hours of weaving would result in a sea-worthy sail 1000 years ago. 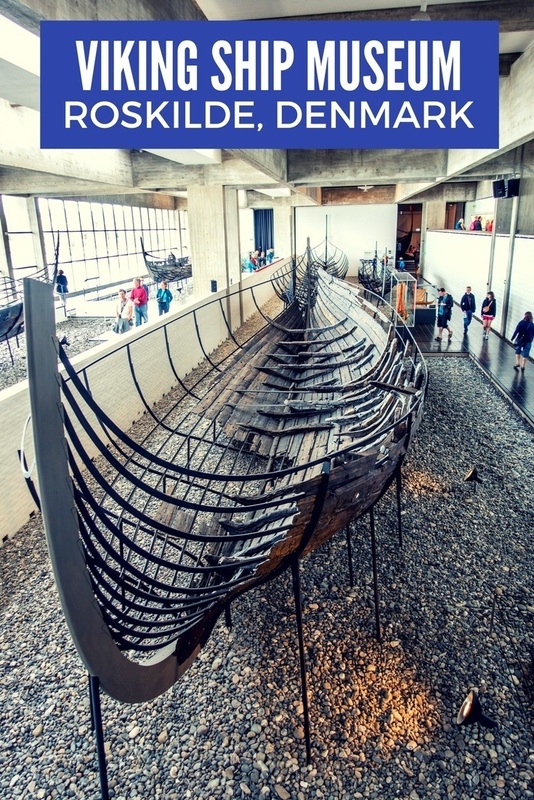 This was our introduction to the Roskilde Viking Ship Museum in Denmark. 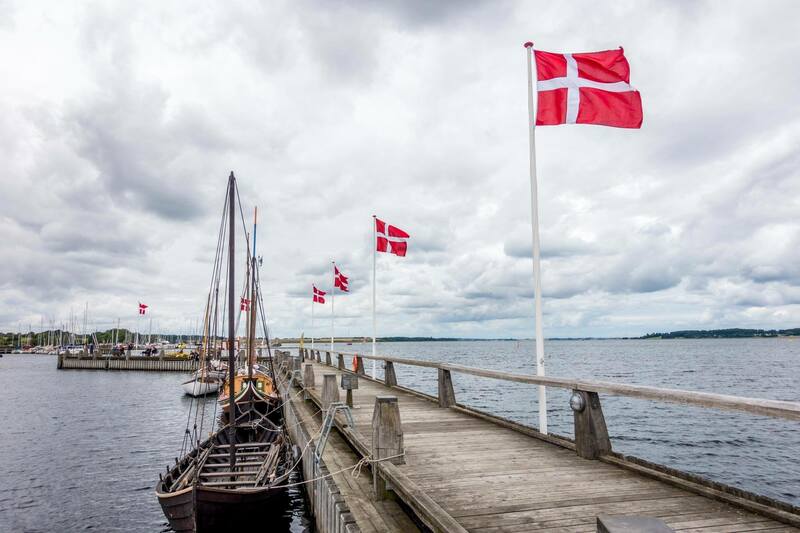 Just a half-hour from Copenhagen, the Viking Ship Museum in Roskilde is home to the reconstructed remains of five Viking ships that date from the 11th century. The ancient vessels were recovered in Skuldelev only about 12 miles north of Roskilde in the spot where they were intentionally sunk some time around 1066 to make a barricade against an attacking fleet. After about 900 years underwater, the ships saw the light of day for the second time when they were uncovered in 1962. The warships, trading vessels, and fishing boat were giant jigsaw puzzles with thousands of pieces when they were unearthed. As we walked through the giant hall, our guide (now sans wig) explained how the fragments were carefully reassembled onto giant skeleton frames in the purpose-built ship hall at the Roskilde Viking Ship Museum. They now sit mere feet from the water of the Roskilde fjord, which is visible just out of reach on the other side of the museum’s picture window. See more fun things to do on a trip to Copenhagen. As our tour continued, we learned more about sail making and ship building, the tools that were used and how everything came together into vessels that could accommodate up to 70 men. We learned about the lives of the Vikings, who apparently have gotten a bad rap and were more often farmers than sea-faring warriors. We learned about the battles of the North Sea in the Middle Ages. It all helped breathe life into the shards and splinters of wood so painstakingly re-assembled in front of us. The Roskilde Viking Ship Museum is more than just a place with several ancient ships, though—it’s a living museum, too. After our tour inside, it was time to head outside. All around a courtyard adjacent to the museum, there were hands-on opportunities to learn more about ships. Visitors could stop by the rope-making workshop to try the craft for themselves, watch carving demonstrations, and even try building their own miniature ships. There were blacksmiths and weavers and tar-burners all demonstrating their various arts as well. One of the most popular attractions was the area where skilled experts build real ships based on the designs of ancient vessels. Using traditional tools and methods, they recreate ancient Viking ships, many of which become part of the museum’s fleet. Though the weather didn’t cooperate during our visit, the museum also offers an opportunity for visitors to join in on hour-long cruises of the fjord or even a full-day “Learn to Sail a Viking Ship” course.